This is where you get an opportunity to have a personal interaction with Sagar. Receive intuitive guidance, spiritual knowledge, and profound insight through 1-on-1 Session(s). A Life Coach's support can not only guide your next steps, but also keep you company along the way. 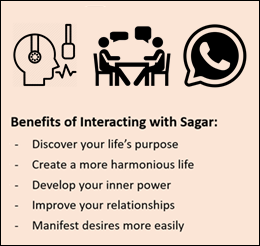 Sagar finds immense joy in individual or group coaching / motivation / training. Remember, nobody can change your circumstances, but you. A Life Coach is always there for you when you feel stuck in your life. However, it is only you who can and needs to create positivity in your life based on what you learn from the Life Coach. 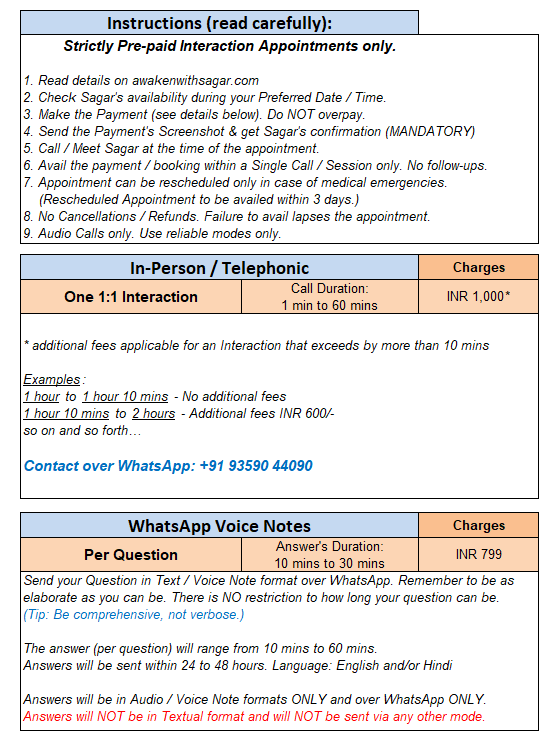 Refer www.sagarsonker.com/disclaimer for more. Charges are in INR and per Individual. Click here to convert to other currencies.